On Dec 1st 2017 Plexonic released Smashies, having WHAT (games) as a publisher. Smashies is physics based arcade game, where the player goes through various obstacles smashing glass items, collecting gems and unlocking new characters. The game was developed using SALTR from the beginning of the project. That’s why we decided to visit Plexonic’s HQ and ask a few questions to their game producers. Our host is Marina Kartashyan, Game Producer at Plexonic, working in the industry for more than 7 years. Marina, thank you for hosting us at your HQ! My first question would be about level design. Smashies do have significant amount of levels that have pretty complex structure. How did SALTR’s Level Editor cover your needs while designing those levels? Thanks for coming up! Smashies indeed has a large set of complex leves. It was the first time we have used SALTR for a physics based title. The Level Editor didn’t let us down at all. Our previous experience with SALTR’s level editor was mostly related to Match-3 games. It was a game changer for us to switch to this real-time level editing concept. For Smashies it performed as well as for match-3 titles. Why you decided to use SALTR’s Level Editor instead of creating your own in-house tool? Well, most of the game dev companies always create a special level editor for each new title. We find it rather wasteful. Once we tried SALTR’s web based solution, it was clear that anything made by ourselves would be miles behind what SALTR can offer. Another great benefit for us is the privilege of having a single universal level design tool for each game we make. Our Level Designers team doesn’t need to adapt to new tools for each new project, and keep working their favorite environment. SALTR allows creating variants of any content, including levels. Is your team making different complexity variants for specific levels? Yes! This is one of our favourite features! Balancing level complexities is one of our most difficult and time consuming jobs. It is done during development stage and after release of the game. So basically almost anyone in the industry, including us, are crippled with this never ending cycle. It is so hard to deliver modified levels and measure the results over and over again. With SALTR this become simplistic task of duplication, editing and publishing - all done in a few clicks. Seeing and analyzing fail rates on a sequence of 1000+ levels suddenly became quite a simple operation for us. Not only that, we are actively targeting different complexity variants to specific user segments, and A/B testing level changes without any interference of our dev team. How easy your team got the SDK integrated? Our dev team didn’t have any issues, and it was done in a few hours. SALTR customer care is also very responsive to our questions and requests. If something comes up we know we will get swift response, which is very important for us to not fail our sprints. We thank Plexonic for this visit and looking forward to next amazing games made by their team using SALTR. SALTR is created having developers in mind. That’s the main reason we are constantly working on developing more functionality to make their lives a bit easier. We are currently working on SALTR Builds project which will focus on file sharing among the teammates, users and application testers. Currently the project is going through beta version testing with limited functionality. After initial testing and feature set finalization, SALTR Builds will be introduced to wider audience. This time we’ve decided to make the functionality not only accessible for logged in users, but also guests. Surely, SALTR users will get more functionality and flexibility with this new feature, but essential features will have public access as well. Stay tuned to learn more about the upcoming project. 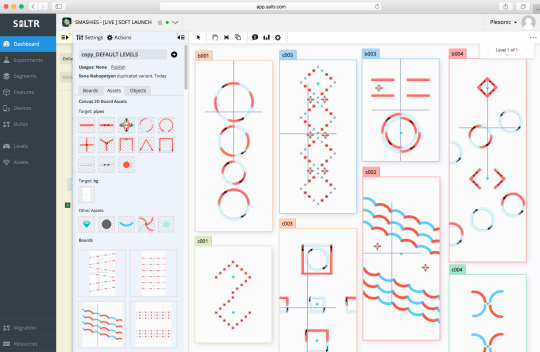 We recently released SALTR’s new version! New: you can add devices now on the fly by opening API Console right from segment’s or experiments “Assigned Devices” list. New: multi-cell assets are here! 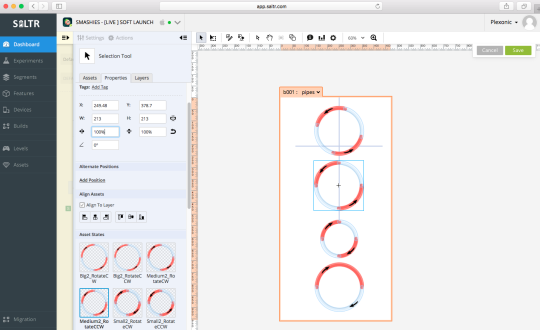 In Level editor enjoy creating complex assets sitting in multiple cells in matrix boards. Removes huge amount of pain from developers! New: now you can embed boards into each other (matrix into matrix & matrix into canvas 2D is supported currently). New: funnel events are enabled allowing you to measure user conversion through a funnel of sub-events. New: new “Path” tools allow you to define any amount of paths for an asset instance (bezier or linear). New: Level Win/Lose ratio analytics! Yes, this is big! 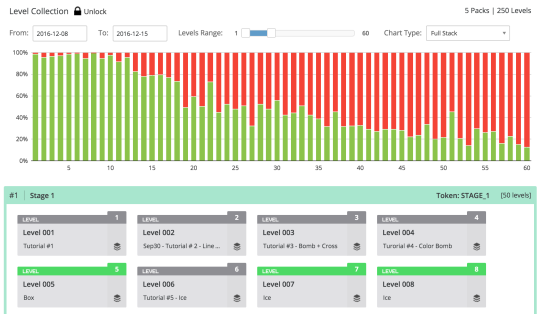 Your Level collection page will show you a nice chart about this, allowing you to see where the problem exactly is and act instantly. New: our charts also got CSV export option as well. Definitely will ease your life if your work with more or less complex data! Fixed: chunk management in Matrix boards in case of moving them from layer to layer. Fixed: you can have empty chunks in Matrix boards a t the moment. This allows to use chunks simply for marking some areas of the board, which is pretty cool and a life-saving thing to have. Fixed: in level editor if you have unsaved changes and click on a link redirecting you to another page, we will ask you a confirmation before redirect. This will save a lot of changes lost by an accidental click! You are welcome world! Fixed: improved asset state details viewing & editing popup. Fixed: improved UI for feature rules editing. Fixed: duplicating instances is easier now and works like a bliss! Some great changes and improvements are live! New: Our brand new Dashboard is made to make your day to day app management easier. Now “All Users” segments is a part of Dashboard with all its analytics & charts. New: Device management page is redesigned and now it is accessible from left sidebar for each app instance. Registered devices are crucial for development and testing, so we cutted of a lot of cluttering UI and made their usage dead simple. New: We also added “Unassign From All” action for devices. It allows you to free your device from all assigned segments and experiment partitions right away. New: Many level designers tend to have dozens of boards in their levels. That number made hard to find specific board in the Level Editor. That’s why we added a Locate button near Boards List dropdown. It will scroll the screen and make selected board visible. New: API Console is now accessible from new Devices page as a popup! Also we have a added button for your browser’s IP auto-detection! No need to Google “what is my IP” from now on (of course for this to be useful your device should be connected to the same network as your browser’s machine). New: All popups in SALTR are now draggable! Small change, but so much useful, especially when you have some data in background! New: Segments and Experiment Partitions filtering dialog UI got a nice upgrade and it is much easier to add new criteria now! New: Now you are asked to set feature’s Required status from ”Add Feature” dialog. Much more straightforward approach! Fixed: Many of our customers do have more than 1000 levels in some of their games. That number made Level Collection pages to become sluggish. Enter ReactJS! The fastest JS library is now being used in many of SALTR pages and will make user experience blazingly fast. Enjoy! Fixed: JSON Editor was behaving weirdly when you were trying to copy-paste some text in the Raw Editor mode. JSON is sacred, so no tolerance was expressed by our team towards this issue! Fixed: Functional of migrating a snapshotted variant was broken. Not the case at the moment! We have been working all summer to deliver these changes to you! New: We have much improved UI in Experiments page. Now there are published and unpublished experiments. You can configure experiments correctly and then only publish them into dashboard. Experiment grouping is much more simpler now as well. Simply drag & drop experiment onto existing group or single experiment in dashboard, or chose publishing grouping option in Publish popup. New: We removed Default Variant flags in Features and Levels, as we saw that life is simpler without them! New: Manage Boards mode in Level Editor now allows you to edit all boards’ API Output, token and size properties. This is so makes this mode so much more useful and saves a lot of time when you deal with levels containing many boards. New: In Matrix Boards selected asset’s cell now has a highlight making easier to see which asset is selected. New: You can drag & drop the selected asset in Matrix Boards. Simple addon, but so useful! New: Now you can use wildcards in PO Rule Tokens to apply the rule onto multiple PO-s at once! So cool and saves so much time in certain cases! Fixed: “Copy Board To…” and “Migrate Feature” popups UI-s are simpler and cleaner now. Enjoy! 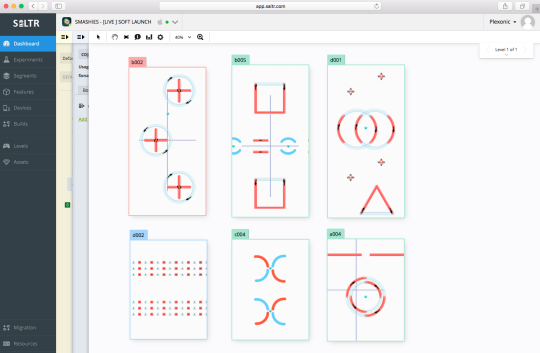 Fixed: When copying assets using Alt+Drag in Canvas boards, now focus stays on copied assets. That was the right thing to happen anyway! Fixed: We had an issues with Canvas boards resizing, sometimes the wrong size was applied. This annoying thing is gone now! Fixed: Also when Canvas boards were resized the content was weirdly scaled and not cropped. Not it works perfectly and you can see which part of the content stays out of the board limits while resizing it. Fixed: A lot of issues are fixed related to JSON Editor and its Rules. Will make your work smoother, even if you are used to do weirdly complicated stuff :). We have a new version with a shiny set of improvements and additions! New: Great news! Property editor now supports arrays! Full JSON compatibility achieved! New: We also added a Description field in the Property Rules. This means that you can write a detailed description of the field and we will show it in a tooltip in all variants where rule is applied. No more uncertainty about what that or this field was about and what can be changed in it! New: Level Collections got new Preview mode allowing you to see all present level variants previews one after another in one screen. Level balancing and planning was never so easy. New: If you have a property object popup opened while editing a level and want to share a link to a teammate, just send the URL. It will navigate her exactly to the level and open the specified property object popup. So much more convenient! New: Want to rollout your new cool feature gradually? Now we have an OFF variant explicitly present in variant list allowing you to simply publish the feature as it is turned OFF in any segment or experiment partition. Working with feature flags became much easier with this! Fixed: A weird bug was fixed in Migration page, preventing you to overwrite board settings when migrating levels. Fixed: In a certain situation it was possible to create 2 assets with identical tokens, and that is not allowed to happen ever! So it is fixed. Fixed: A whole bunch of UI bugs and glitches that you probably won’t be interested to know about in details, but just go on and play around SALTR and you will feel that it is better, simpler, faster and more reliable! The great leader approves this release! New: Levels now have Default Variants as well, which make variant creation and consistency much more better. Setting a variant as default paints it into green and puts it on top of the variant list, enjoy! New: Features got a nice improvement on their Property Rules mechanism! Now you can define mutually exclusive properties & also create templates for the properties and groups allowed to be added into the feature. This makes SALTR’s feature property editor a much nicer and more secure place to be for anyone who modifies feature for their audience! New: We improved App Migration page interface to be much more compact & clear. Give it a shot, folks! New: Property Objects now got a larger popup to be more comfortable to work with. We also show now the level and its variant names in the popup to highlight the ownership of the current PO users is working on. Fixed: API Console sometimes were not including request/response summary data in the data output in console. That caused some difficulties for some of our valuable users, so we had to fix it! Fixed: There was a bug in Level Publish popup, that was hiding all snapshot variants after publishing a level variant somewhere. That bug had to be gone! And it is! Fixed: For some reason you could target the same cell in a Matrix Board from several Property Objects. But actually the cell can handle only one property object. We added a check, so you can’t target already targeted cell. Surely this will clear a lot of trouble for some match-3 game makers. Fixed: In some situations devices and device groups assigned to an experiment partition was impossible to un-assign. The bug is gone, so you can confidently assign/un-assign any device into any experiment partition!